My name is Marie and I am addicted to cookbooks. Sadly, it’s true. I collect cookbooks like some people collect Pokemon cards. I have a whole bookcase devoted to cookbooks. In fact, all of my cookbooks don’t even fit there; some of them have to live in a bookcase in the basement. But I use them. I really do. Well, most of them anyway. Some of them I just read and enjoy and think about the time that I might have some day to cook some of those luscious recipes, though I know they will never look as pretty as the pictures in the books. Today, I thought I would share a few of my favorite cookbooks with you–just in case you, too, are really a cookbook junkie and need some inspiration. Or, in case you have some favorite cookbooks you think I should add to my collection. My edition was published sometime in the ’70s. I can’t tell exactly when because the flyleaf fell out many years ago. I love this cookbook; it’s one of my go-to books when I need some basics like roasting meat or making substitutions. It also has the best caramel recipe on the planet in it. If you buy the new version, the recipe won’t be the same (I looked). Oh, and the dinner rolls; they’re also to die for. I am required to bring them to every family dinner and make them for every special occasion ever. Or else. My mom has an even older version of this cookbook with sections and recipes that aren’t in mine. I’m hoping she’ll leave it to me in her will. It’s the one on the left. Yes, I have two copies (I really have three, but more on that in a minute). My husband gave me the 2006 printing of this for Christmas just after it came out. No, that was not a statement of my cooking abilities. He is smart enough to tell me I am a wonderful cook (it’s mostly true–it’s one of the few things I am good at). The Joy of Cooking is absolutely the bible of cooking. All the basics of making everything are in this cookbook. If it isn’t in here, it probably isn’t something you need to know. Like the BH&G cookbook, this is the one I turn to for all the basics of anything. 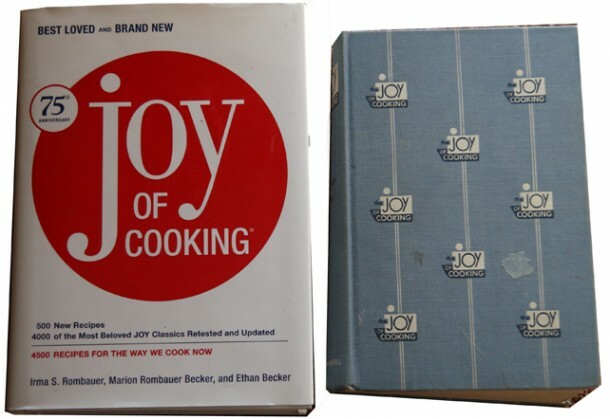 I also have the 1951 edition of The Joy of Cooking. It’s almost cooler than the new one. It has really nifty stuff like canning recipes and preserving food and planning dinner parties and other nifty things. Yes, I do know that I need to keep up on current canning times and techniques from my local extension service, but it still has cool recipes. It was my mom’s and she gave it to me years ago. It finally started falling apart and now it’s held together with a rubber band. Lucky for me, I was at the Goodwill one day (I LOVE Goodwill) and I found another copy–in mint condition. It’s practically perfect, looks like whoever owned never used it. That’s ok. I use it. And now I’m able to carefully tuck away mom’s copy so it won’t lose any more pages. 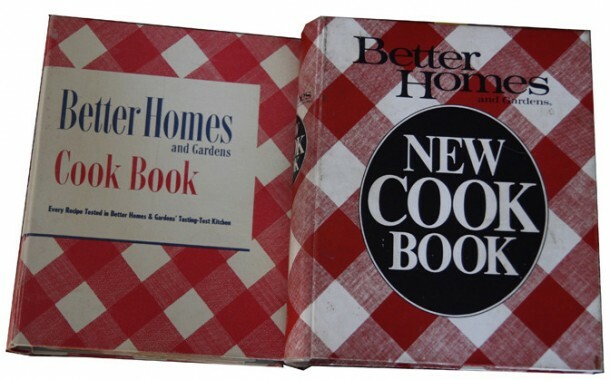 Are you getting an idea that I like old cookbooks? It’s true. I do. 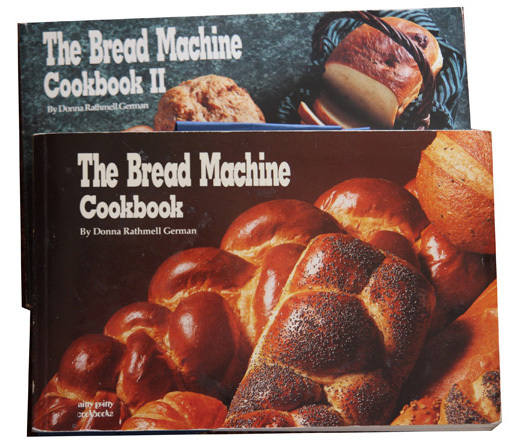 They have so many cool recipes in them, back from the days when people really cooked–from scratch. Another find from the Goodwill. 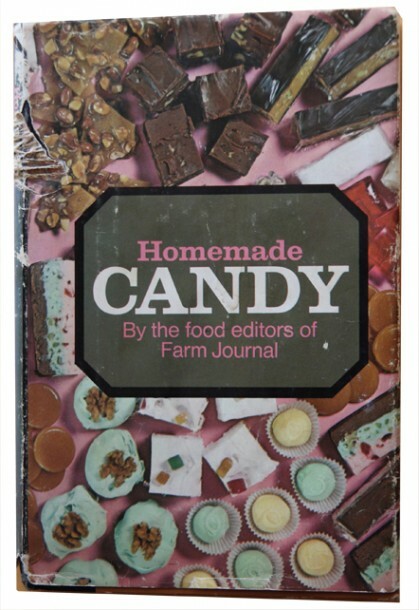 This one has some amazing candy and confection recipes in it. They even have candies made with ingredients like cheddar cheese and sweet potatoes (not in the same recipe, though). Some day I will get through them all. Well, except for the nougats. I don’t like nougat so much. My sister gave me this one about 15 years ago or so when I had a garden that was going crazy. It has some yummy recipes in it. One of our favorites was zucchini relish. We canned about a dozen pints one year. I’m looking forward to growing zucchini this summer and canning it again. I love sweet relish and this was even better. I really missed it living in New Mexico where nothing wanted to grow in our sandy soil. 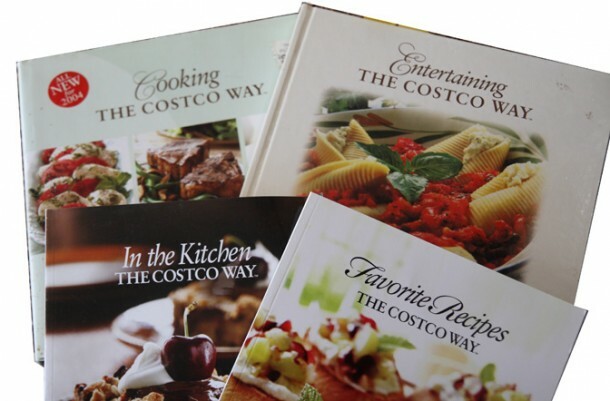 When you spend as much time and money at Costco as I do, a cookbook is the inevitable next step. I think I have them all. They have great creative recipes in them, from the gourmet (not really my style but fun every now and then) to the every day. And you know if the ingredients come from Costco, they’re going to be good. It’s Jell-o. Do I really have to explain this one? 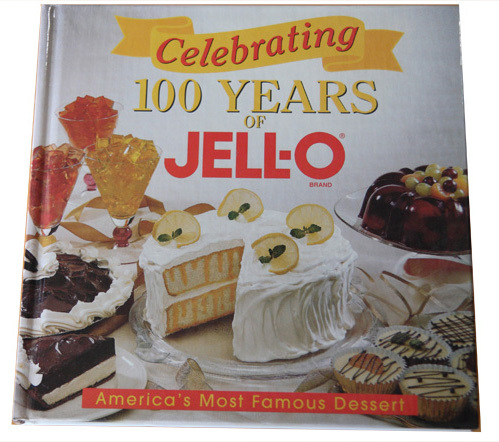 So many fun and colorful desserts in one book. Admit it. You like Jell-o. Everybody likes Jell-o. One of the best is the Gaiety Pastel Cookies on page 84. There’s nothing like being able to color coordinate your cookies to your event. If you have kids–or just to satisfy the inner kid in you–you need this book. As you can see, this book is well worn. When we were kids, we would look at this book and dream about birthday parties and other parties. 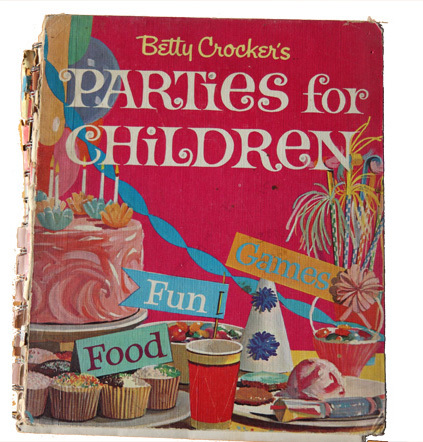 Not only does it have good party recipes, but it has whole parties planned within its brightly colored covers. Games, decorations, invitations–they’re all there. This is one of a series of Betty Crocker cookbooks. I love these books. I think I have them all. There are some larger books. The recipes are good and simple, with very clear instructions, but not pedestrian fare–at least it was in the 50’s and 60’s. 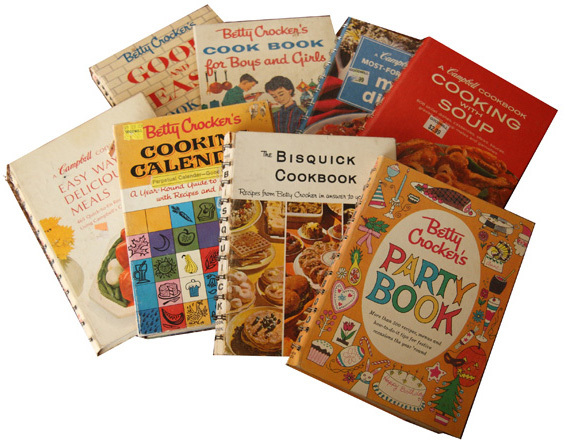 And there’s a set of smaller books, published by Betty Crocker and by Campbell’s. 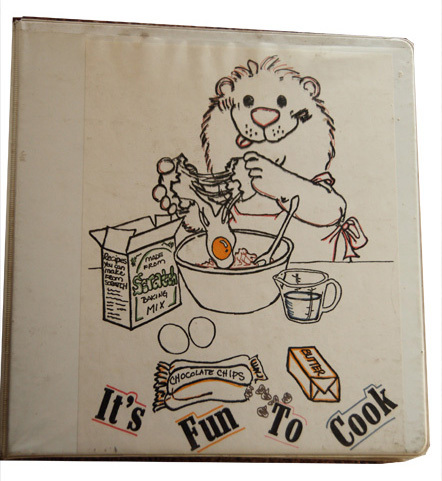 I learned to cook by these books, especially the Bisquick cookbook and Cooking with Soup. You can see that I’ve had to acquire my own copies, from Goodwill, of course. 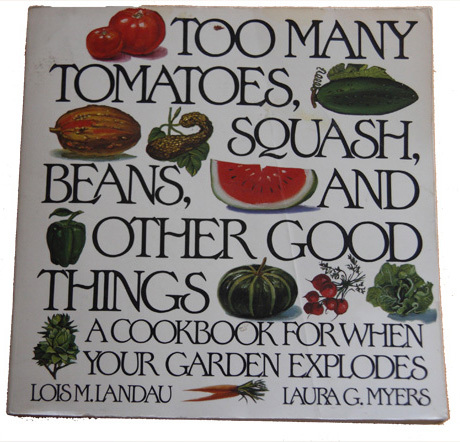 Not all my cookbooks are old and out of print. This one’s still being published–it’s even on sale at Taste of Home for a bargain price right now. 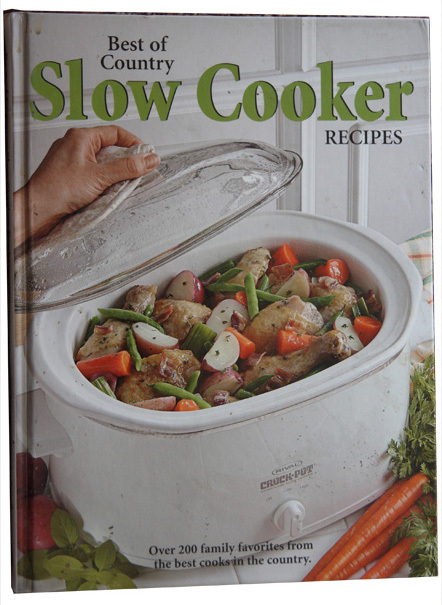 So now you know it’s published by Taste of Home which means everything in it is good and, as my kids say, it’s “real food.” I love my slow cooker and we use it almost daily, especially in the winter. This cookbook takes care of the rut of making the same things every week, but without breaking the bank or making me hunt for strange and exotic ingredients. These have been indispensable for me over the years. I’ve had a bread machine nearly as long as there have been bread machines. It makes such an odd-shaped loaf, though, that I really don’t like to bake in it. But it is very convenient for making my bread dough. Sometimes I use the recipes in these books as they’re written, but more often I use them as a starting point, adapting them and changing them to whatever I’m in the mood for. I think they have a recipe for just about everything you’d ever want to make in a bread machine. 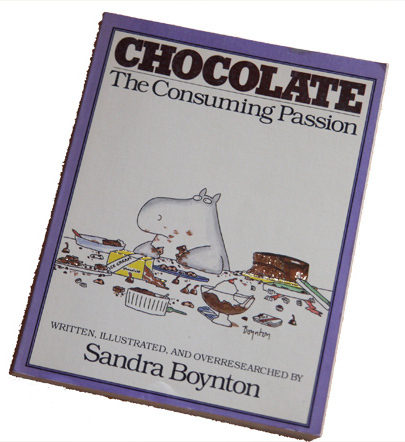 This one is not so much a cookbook as an ode to chocolate, but it is my favorite chocolate book ever. Besides, the adorable Boynton animals, there’s Sandra Boynton’s snarky wit to entertain and enlighten you. There are also some chocolate recipes. My favorite is “Molding Chocolate Bunnies.” Unfortunately, this one is out of print, so you may have to do some searching to find a copy of your own. It’s worth the effort. I was fortunate enough to have, umm, obtained it from my mom. I always knew she liked me best. I saved the best for last. Yes, I know there are 11 and not 10, but the collection wouldn’t be complete without this one. This is the most used cookbook at my house. It’s a two-volume set and clearly well-used from all the marks on the cover. Unfortunately, you can’t get this one because there are only four sets. I own one and my three sisters own the rest. And we aren’t giving them up. Our mom made these for us about 20 years ago. She is an amazing cook and has collected recipes and made up her own for years. And she finally put them into a book and gave us each a copy. And this one I use several times a week. This is by no means an exhaustive list of the best cookbooks (obviously, since I haven’t even touched on the basement bookshelves yet), but it is a list of my favorites. What are your favorite cookbooks? What else do I need to add to my obsession collection? 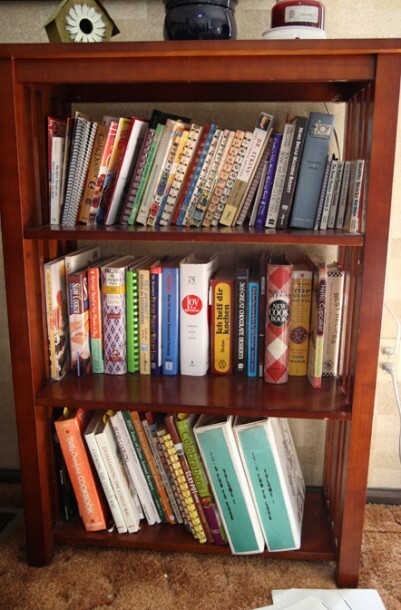 I enjoyed your post about collecting cookbooks. I like to collect them too. My entire cabinet in the kitchen is dedicated to them. 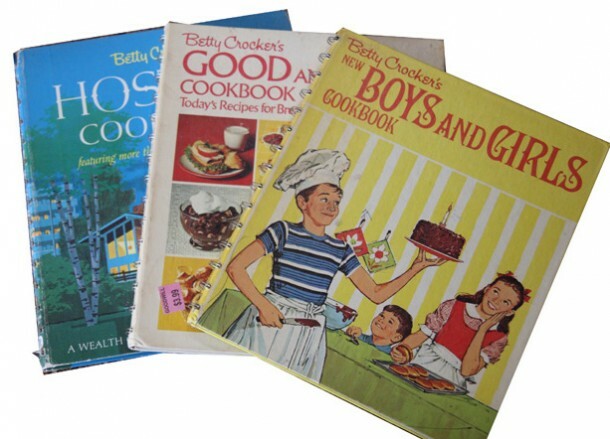 I have the boys and girls book by Betty Crocker. I bought it because I thought it showed a lot about the era. I'm happy to say both my sons cook. I love the crock pot because its so easy to make brisket with Claudes marinade or vegetable beef soup.